Good morning! I hope you all had a great weekend. I have been asked to do a post about my favourite restaurants in London as well as one on basics/wardrobe staples so I will be doing these shortly. 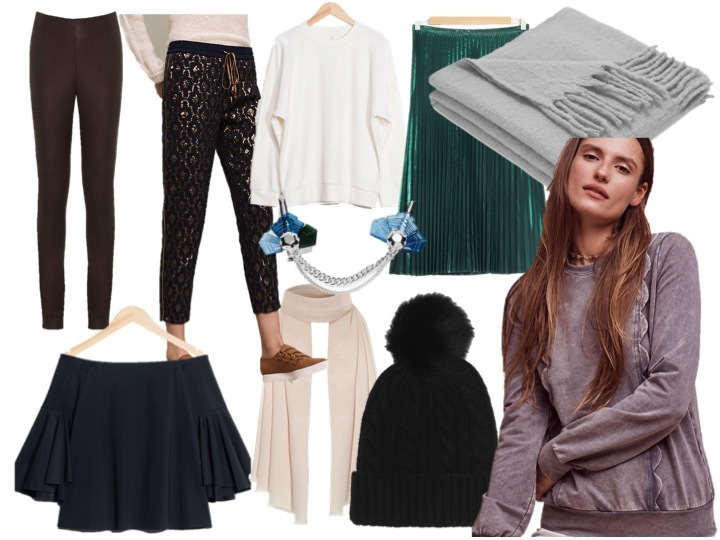 I will also do a post with some of my favourite designer items out now and for each one I have found a highstreet alternative for any of those who want to spend a bit less! Now back to the crazy weekend that is Cyber Weekend: today is the last day of sales for many retailers so I have rounded up again some of my favourite pieces. You can click on the images in the post to shop them directly! First off, one of my favourite high-street stores: &Other Stories. I find that they have really great quality items and are always very on trend. And they are giving 10% off with the code FRIENDS. With a penchant for all things velvet at the moment, I fell in love with this sweatshirt that comes in both white and black options. If you are looking for the perfect party dress, then check out this (love the name!) “disco dress.” Love their knitwear too – best picks include this sparkly knit available in lots of colours, this frilled collar knit, and this metallic mohair sweater that is great for every day use! Also obsessed with this faux fur sleeved coat – perfect way to dress up any outfit during the colder months. Shop my favourites below. Speaking of basics, I am loving this shop ME+EM especially for great wardrobe staples such as a rollneck for the winter, a cosy maxi dress, an oversized scarf and a breton stripey tee. You can get 25% off their “winter warmers.” Also (not discounted but) how gorgeous are these leather trousers – definitely one for my wish list! Browsing online can be tough because sometimes you want everything and I feel that way with Anthropologie at the moment. They have some really cute things in both fashion and homewares and you can get 20% off everything with the code GIFT. Continuing with my sequin obsession, how cute are these pants? I love faux fur throws in the winter – they add a bit of warmth to any room and this one is perfect. They have pretty dresses such as this midi – great if you are anything like me and don’t want to spend all winter in trousers. Their Christmas shop is also great with lots of stocking fillers, decorations and party wear all at very reasonable prices. Again you can get 20% off everything with the code GIFT. Another of my top retailers where I buy lots of pieces by American designers that aren’t available elsewhere is Revolve. LPA is a gorgeous label – I wore one of their pieces in Mauritius (the silky off the shoulder top paired with my Missoni shorts.) A few of you have been asking after my loungewear on Insta stories and I am often wearing leggings by the brand Sundry – they are plain, comfortable but with a little fun detail such as stars down the sides of the leg. I know that it can be a pain to get the items shipped from the US but I have yet to return anything I have ever ordered because I have loved all the pieces. And finally, I thought I would include a retailer I recently found and really like. It is called Made and they offer furniture and homewares at very reasonable prices. Love all of their Ottomans and lamps, throws and although there are no major discounts you can get free shipping. Shop my top picks below.